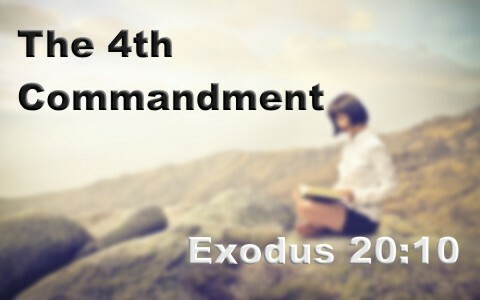 What Is The 4th (Fourth) Commandment In The Bible? What is the Fourth Commandment in the Bible? How does this relate to the Sabbath and Sunday? How sad that people see the Ten Commandments as rituals, rules, and restrictions, when it’s actually like the “Dangerous Curve” sign on a mountain road or a stop sign that is intended to save lives. Would we say that the traffic laws are only rituals, rules, and restrictions or that they serve a purpose and that’s to keep us safe (and even alive!). The Ten Commandments are the perfect set of laws, which if kept, would eliminate crime, murder, theft, layoff law enforcement agencies, erase the debt, end the wars, and just about every evil under the sun you can think of. What is commonly thought to be about a million laws in this country could be replaced by ten laws which are the Ten Commandments. Of course, the problem is not a matter of head knowledge but of the heart (Jer 17:9). We are not smart enough to govern ourselves as “Every way of a man is right in his own eyes, but the LORD weighs the heart” (Prov 21:2) and “The way of a fool is right in his own eyes” (Prov 12:15a) so God’s ways are not the ways we choose to live by. This is why God gives us, for our own good, the Ten Commandments. Do them and live! “the seventh day is a Sabbath to the Lord your God. On it you shall not do any work, you, or your son, or your daughter, your male servant, or your female servant, or your livestock, or the sojourner who is within your gates” (Ex 20:10). This rest reminded them of the Creator’s work in creating everything and Who He was. If even God rested on the seventh day, and yet never tires, how much more do we need to rest, “For in six days the Lord made heaven and earth, the sea, and all that is in them, and rested on the seventh day? Therefore the Lord blessed the Sabbath day and made it holy” (Ex 20:11). This has been such a divisive issue among Christians. I believe it is safe to say that we can’t judge others for observing a Sabbath (Saturday) but neither can they who observe the Lord’s Day (Sunday). Jesus or the Apostles never once commanded the observance of the Saturday Sabbath, which is the 7th day of the week. Christians began to worship on Sunday’s after Jesus resurrection and the hundreds of years that followed. There is liberty in this, just as the Apostle Paul expressed to the Colossians, “Therefore let no one pass judgment on you in questions of food and drink, or with regard to a festival or a new moon or a Sabbath” (Col 2:16). Paul would have never written this to the Colossians if the Jews had not been trying to sabotage the gospel by requiring observances of the Jewish new moons, feasts, and Sabbath day and that they were necessary for salvation. Jesus gives us a great lesson about the Sabbath by saying “The Sabbath was made for man, not man for the Sabbath” (Mark 2:27) because “These are a shadow of the things to come, but the substance belongs to Christ” (Col 2:17). The shadow isn’t the real thing; the fulfillment was in Christ. These foreshadowed His coming and His work on the cross. When you read the Fourth Commandment about the Sabbath, it is always addressed to Israel. Never is it commanded to be observed by non-Jews. The New Testament makes no such claims that we must worship only on the Sabbath (Saturday). In the giving of the Fourth Commandment, God told the nation of Israel to “remember that you were a slave in the land of Egypt, and the Lord your God brought you out from there with a mighty hand and an outstretched arm. Therefore the Lord your God commanded you to keep the Sabbath day.” (Deut 5:15) That narrows it done to them. When the Sabbath is addressed more comprehensively in Exodus 31, the Lord said “Therefore the people of Israel shall keep the Sabbath, observing the Sabbath throughout their generations, as a covenant forever. It is a sign forever between me and the people of Israel that in six days the Lord made heaven and earth, and on the seventh day he rested and was refreshed” (Ex 31:16-17). Twice God mentions that it’s a special sign for Israel. In other words, the observance of this day would mark them as different from the rest of the world and it still does to a great extent. We can get into debates or heated arguments about the Sabbath or Sunday worship and that’s sad because we are to become one in mind, body, and spirit and Christ is not divided, “Therefore let us not pass judgment on one another any longer, but rather decide never to put a stumbling block or hindrance in the way of a brother” (Rom 14:13) and to “take care that this right of yours does not somehow become a stumbling block to the weak” (1 Cor 8:9) be kind toward “the one who is weak in faith, welcome him, but not to quarrel over opinions” (Rom 14:1). Grace is only required when one has transgressed the Law of Yahuwah. If there is no law, why do we need Grace? It astounds me when I read / hear ‘I don’t need the law, I am saved by grace’. You can’t separate the two. They are joined at the hip. Hello Mr Morris. Thankfully we are not saved by keeping the law but the law shows us we cannot save ourselves but must look elsewhere; precisely looking to Jesus, the Author and the Finisher of our faith. Saved by grace and not by law-keeping or works but by grace alone. Having said that, we do not ignore the law. We are not saved by the law but the saved will strive to live by the law of God. Yes, we are saved by grace through Yashua or Jesus but we are not above the law.. every word Yashua spoke was from his Father, he only spoke about his fathers kingdom. (Not my will but yours be done……). he was the sacrifice like animals in the old testiment. He came to restore us back to the Commandments of his father. Nothing has changed! Read the red letters —-Christians……..everything in the new testiment was already written in the old. Don’t people study the bible. NO! They just read right of Matthew. WAKE UP! He is not in a church, he is a relationship with his word. He is the WORD that became flesh and dwelt among men.